I hate having to keep bird locations secret but even in the 21st century sites have to be suppressed for the sake of the birds. This is particularly true in the case of rare breeding raptors. 1) Disturbance at the site from birdwatchers and photographers. In some instances this can be controlled with for example a hide set some difference from the nest but often the location must be kept secret. 3) Direct persecution. I’m afraid that there are still some gamekeepers who consider anything with a hooked beak to be their enemy. This is especially true in our upland areas. 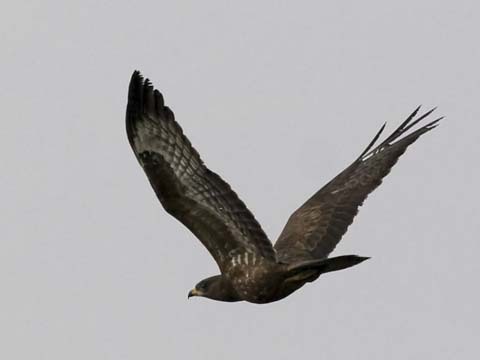 It has been estimated that there is enough habitat for 300+ pairs of Hen Harriers in northern England. This year not a single pair bred succesfully. The bird I was after on the 21st was Honey Buzzard. Between 30 and 100 pairs breed in the UK, they are no threat to game interests as their food is mainly wasp larvae, but they are susceptible to disturbance and hence should be watched from a distance. A few breed in the New Forest but they have been late returning from Africa this year. I know of anothe site and after about 90 minutes of watching I was rewarded with views of one. I obtained a view comparable to this, although much further away, as the Honey skimmed the tops of the trees. Photo from the internet. On the 21st I was after another rare raptor, Montague’s Harrier. This is a very rare breeder indeed, with perhaps less than ten pairs in the entire UK. There used to be a pair that could be seen from an accessible site in north Dorset, but in recent years there have been few sightings. A juvenile bird was seen on the 20th at another ‘undisclosed location’, but as it is less than a year old, it probably was a migrant rather than a bird looking to breed. Either way, searches of the area drew a blank. I continues on to Martin Down, a wonderful area of chalk downland just over the border into Hampshire. Another Woodchat Shrike had been seen there and after a bit of searching I had good views, considerably better views than the dot in the distance that I saw at Keyhaven just over a week ago. Other interesting birds included a purring Turtle Dove, two Grey Partridges and a singing Quail. Quail arrive late from Africa; in some years we get a second invasion as birds that have hatched in southern Europe move north in their first year before migrating south in the autumn. Almost always located by their lovely ‘wet-my-lips’ song coming from tall or inaccessible vegetation, this is a species that is almost always a ‘heard only’. A link to the song of Quail and Turtle Dove is included below. This Turtle Dove purred from this branch for some time. A massive decline in recent years means this bird could go extinct as a British breeder in a few decades. Reasons include agricultural intensification, winter habitat destruction in Africa and hunting on migration. There is some good news on the rare bird breeding front. I have just learnt that a pair of Great White Egrets have bred succesfully in Somerset, the first time in the UK!